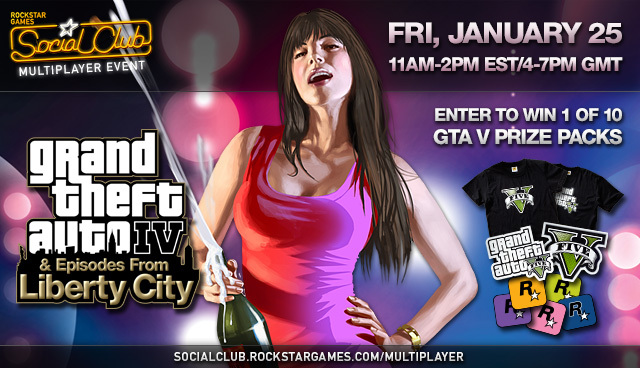 This Friday, 25th January, you can join Rockstar from 4-7PM GMT (11AM-2PM EST) and play in a variety of multiplayer modes from GTA IV, The Lost and Damned, and The Ballad of Gay Tony, on all 3 platforms. For a chance at getting invited into a game you'll need to add one of the devs to your friends list. During this time, Rockstar will open the sweepstakes page where you'll have a chance to win a GTA V prize pack in the giveaway, which include t-shirts and stickers. For more information check the newswire article. Goodie. Will the servers work this time?